On 2nd Street the trees are barren. The concrete sidewalks leading to St. Mary’s hospital are a dull steel grey, a seamless blend into the darkened overcast skies on a late fall afternoon. There is no horizon. The seasonal vestige; faint, shadowy leaf prints left by tannins of giant red oaks. Punctuated by the splattered droppings of a thousand incontinent crows, I find myself hop scotching the chalky residue, as if I’m Adrian Monk tap dancing to avoid the lines. Aside from the avian catharsis, Rochester, Minnesota is a robust city. By the numbers, one hundred thousand people enjoy an 85 mile web of bike and walking trails in a lifestyle so healthy that they, by necessity, find it necessary to import two million sick people a year to achieve homeostasis. I imagine the blackened chewing gum residue, the side-by-side companion of bird poop, must be the healthier, sugar-free variety. What is unhealthy; a belief that hockey is an actual sport, rather than an annuity established by the local dental society. Deception can be comforting, pain free. Walking briskly to a heavy cadence; the composition of taxis, ambulances, employee shuttles, patient transport buses, horns, and everyday commuters on cell phones, the white noise becomes Mozart symphony # 35 . Up ahead, the day brightening delight, a visit with my friend, Joe, the self-proclaimed “waving guy of second street” at his 800 block apt. driveway. Joe’s wardrobe defies conventional dress code. 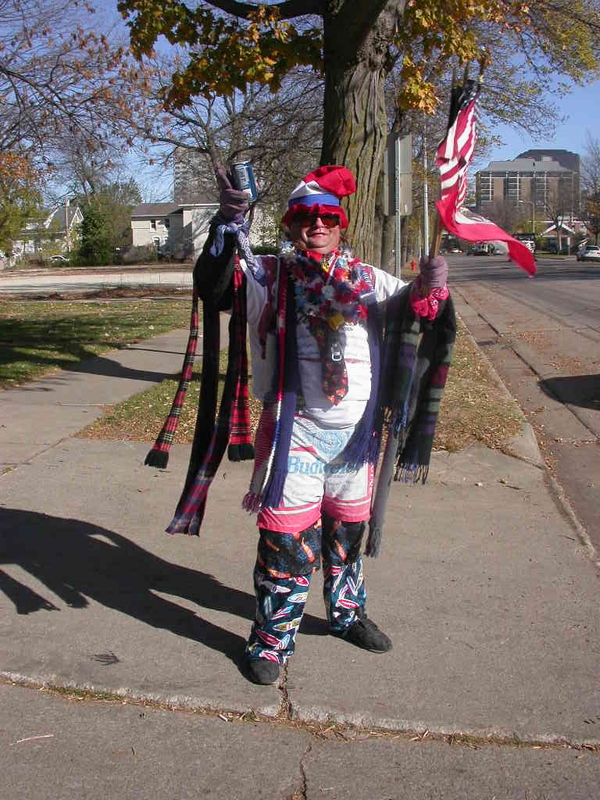 For hours each day, festooned in elaborate bling, multiple hats and scarves, layers of mismatched colorful clothes, Joe waves a half dozen flags at passersby. His technique is graceful as he raises the flags reverently skyward, while concomitantly lifting his heels, a Julliard le grande jéte in constant motion. Perhaps an exaggeration, but to this observer, Joe appears an illusion of flight. The choreography, while not sublime, precipitates stares from the curious, a passing bicyclist disguised as a Mayo physician commenting ‘only in America’, and the staccato beeping from the friendly and familiar; police, cabbies, and bus drivers. For most, however, a 90 degree shun for fear of peering into our collective national soul, the same eye contact we avoid while reading the crayola scrawled cardboard of the jobless at the intersection to the big box store. Why does he do it ? A description of head case, whack job, playing without a full deck, borderline schizophrenia, or choose a diagnosis of convenience, it hardly matters. He is my friend. Does he hear voices ? I think we all do. When no one is listening. I could tell you more, his age, his life, his family, but I won’t….personal privacy has become the trampled stepchild in binary code. What I can share; he enjoys his calling, is very patriotic, optimistic, and believes the world’s ills could be ameliorated if only we were nicer to one another. 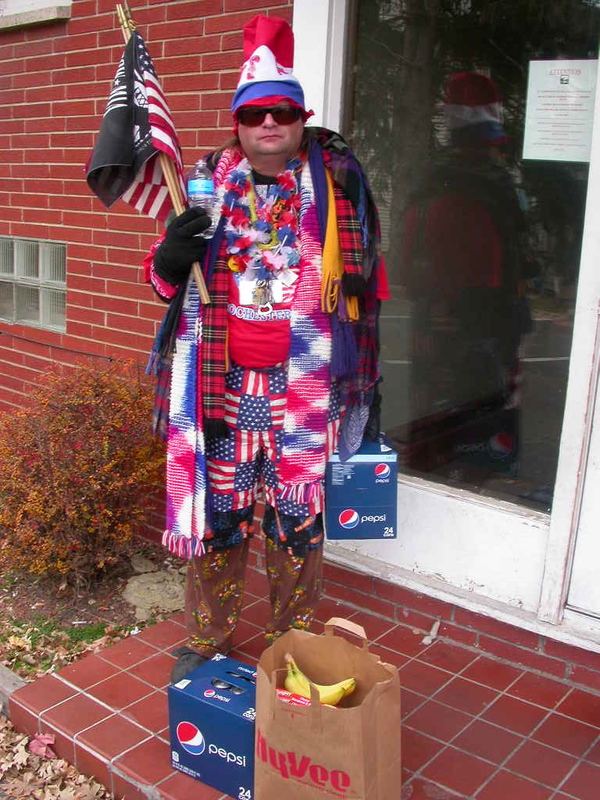 He is addicted to Pepsi, the regular, 150 calories per can, not caffeine or sugar free. So I bring him a case a week. And some cheap frozen dinners. And fresh fruit. The bottom line, Joe is an abdomen and a smile with a happy ending. Today’s flags; Old Glory, POW/MIA, Mexico, Japan, breast cancer, and Greece. Perhaps Joe knows more about the international monetary crisis than he is willing to share. In a world divided by war, political acrimony, obscene economic disparity, religious tension, and poverty, maybe we should put a stethoscope to Joe’s temporal lobe and take a listen. It may be time to treat the crows with immodium.